Hassling the volunteers working hard to make the world a better place makes Austin just another two-bit Texas sleaze town. Don't mess with Texas--they're pretty much a mess already. The Alaska Randonneurs kick off the 2009 randonneuring season with two rides on the Kenai Peninsula. On March 28, the End-of-the-Road 200-kilometer brevet will start from Two Sisters Bakery in Homer. 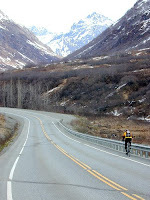 On April 11, the North Kenai Peninsula 200-kilometer brevet will start from the Kenai Safeway. The long-distance bicycle rides are scenic, challenging and noncompetitive. For more information, visit http://alaskarandonneurs.blogspot.com. NCDOT is hosting both the pre-hearing and public hearing on Smith Level Rd on Monday. See the details at OP. 2. Interchange with the future Morgan Creek greenway. On a steep downhill, bikes often approach the speed limit and cyclists need to be able to utilize greater lane width, especially if the lane edges are obstructed by litter, foliage, ice, salt, bad pavement, etc.. For this reason, wide outside lanes (no stripe) are preferable to bike lanes on steep descents. Furthermore, it is never a good idea to put a bike lane on only one side of a two-way street, because that would encourage wrong-way cycling. Wide lanes with Sharrows would be the appropriate treatment for the hill on Smith Level Rd..
Smith Level/Greensboro serves important destinations including Carrboro High School to the south and Weaver Street and Farmer's Market to the north. This section will also intersect with the future Morgan Creek Greenway. It is important that road widening in this section be planned to safely interchange bike & ped traffic with the future greenway--e.g. to allow safe ped crossing where necessary, discourage "wrong way" cycling, and facilitate easy, efficient and safe access for all travelers. The DOT design map for this project doesn't even show the Morgan Creek greenway! On this page we give the portrait of Mr. Thomas Stevens, who started from San Francisco, California, April 22, with the avowed intention of riding around the world (barring the Oceans) on his bicycle. He was born at Great Berkhamstead, Hertfordshire, England, December 24, 1854. Emigrating to the far West in 1871, he had not been east of the Mississippi until he started out on his famous bicycle ride across the continent. Seven men have within the last three years attempted the same feat, but the great difficulties encountered in crossing the 1500 miles of rocky mountain, barren deserts, and bridgeless streams between California and the Missouri River have invariably turned them back. More than one-third of the route followed by Mr. Stevens had to be walked. Eighty-three and a half days of actual travel and twenty days stoppage for wet weather, etc., made one hundred and three and a half days occupied in reaching Boston, the distance by wagon-road being about 3700 miles. He followed the old California trail most of the way across the plains and mountains, astonishing the Indians, and meeting with many strange adventures. Mr. STEVENS reached Boston August 4, and is now in New York, where he hopes to make arrangements which will enable him to complete the journey around the globe; through England, France, Germany, Austria, and Turkey, thence through Asia to the Pacific. This 160mi route takes you from one end of the Amtrak Piedmont's service line to the other. I'm sure a strong and determined cyclist could do it in a single day, but when we rode it a few years ago, we made an overnight camping trip of it, arriving very late at night at the (RV) campground in Asheboro. That is in a "dry" county by the way, so BYOB if needed. Campground staff treated us kindly. We took a dip in the swimming pool. I think there was some all-night industry (timber?) nearby that marred our Zzzzzzs with odor...or noise? or both, I don't recall precisely. I've heard of one other group planning to do something similar this summer (2009), but they're using a longer route, through the Uwharries and making a three-day (two night) trip of it. Sounds like a lot of fun and adventure! Cross NC-68; Wendy's, Supermarkets, etc. 55.3 R - Hanging Rock SP Rd. Update: Amtrak no longer charges a fee for bikes on the Piedmont train! Also, this summer they will add mid-day service, with bike racks on-board! This is a nice rolling route through the rural Piedmont region. From Snow Camp to Green Level it covers the same territory as the NCBC 200 brevet, but with a differing route to provide some variation and uses some quieter and perhaps slightly shorter and maybe hillier roads. Since these roads see less traffic, they get less maintenance and may have a few minor surface blemishes. The start (Greensboro Train Depot) is about 500' higher than the finish (Raleigh Train Depot), so overall the route is downhill. That said there ARE some climbs throughout, especially in the last 25 miles (east of Jordan Lake). Biggest descent: Jack Bennett Rd approaching Lake Jordan. Biggest climb: Highhouse Rd by Bond Park in Cary. Alteration: If you go straight on Lewter Shop Rd, instead of turning right on Green Level Rd W, it will become Green Level School Rd which takes you past Cary's Thomas Brooks Park before rejoining Green Level Rd W. The park has water and clean restrooms. The Amtrak fare, one-way, is about $ 11.00. 52.5 R 3.2 Jack Bennett Rd (Traffic Light) Downhill! becomes High House (1615) Climb!